Red curry coconut clams from Ugly Fish Asian Bistro. North Idaho restaurants have added six more reasons for diners on either side of the state line to enjoy Inlander Restaurant Week. Up from 16 participants last year, 24 Idaho locations will feature cuisine ranging from casual to classic fine dining. Many have strong ties to Washington restaurants. Ugly Fish Asian Bistro is a sister restaurant to Liberty Lake's Ding How. It opened in Coeur d'Alene's Riverstone community in 2011 with a contemporary flair. Red seating, custom water features built into the wall and sophisticated, multicolored LED lighting make this a visual treat while you ponder the culinary ones available. The menu reads like a travel catalog of Eastern cuisine: Japanese sushi, sashimi and bento boxes; Thai noodle dishes, wok stir-fry entrées and mixed plates of Chinese vegetables and meats, even Korean influences. So many options! 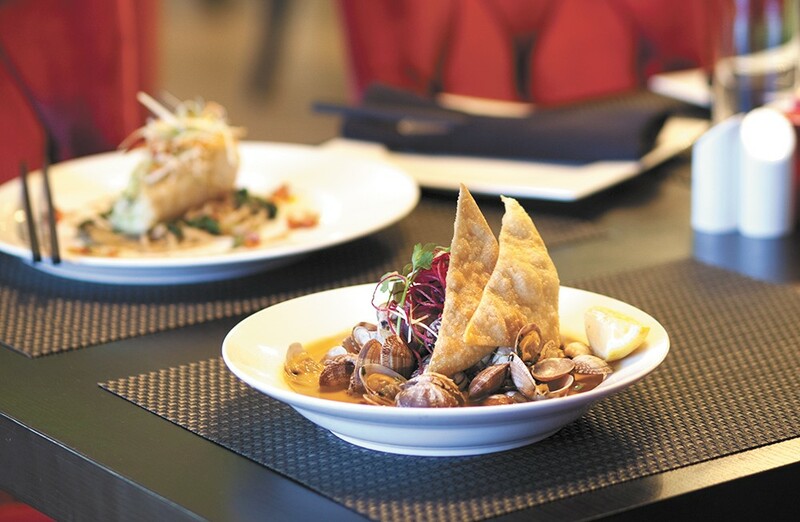 For Restaurant Week, Ugly Fish has narrowed the choices to three courses ($28) featuring signature dishes like the house-roasted duck in hoisin sauce, grilled citrus Chilean sea bass over Udon noodles and ginger-infused clams. They're even doing a sushi trio. Located in the Blackwell Island marina on the northwest shore of Lake Coeur d'Alene, Cedars Floating Restaurant is a quietly elegant destination in winter, with a lovely view from inside its unique, round dining room where the Spokane River and the lake converge. Cedars chef Jim Barrett culled the best of the restaurant's surf-and-turf offerings for a special menu of upscale comfort foods for Restaurant Week ($28). Traditional cedar plank salmon gets a boost with honey-chipotle sauce, while their signature Angus beef prime rib is aged 28 days and slow-roasted. You may appreciate soup as a starter. Although winter is as beautiful a time as any to be on the lake, it can be chilly. Warm up with New England clam chowder or rich, savory French onion. Save room for dessert: A delicate cream puff is paired with huckleberry ice cream. Or try flourless chocolate cake with raspberry sauce or crème brûlée. Another restaurant with strong Washington ties is Scratch Bistro, which originated in downtown Spokane with a full bar, a larger menu and location, and the additional space called Rain Lounge. Located at the corner of Fifth Street and Sherman Avenue, Scratch is a cozy place for a leisurely weekend breakfast, lunch al fresco on a warm summer day or an intimate dinner any time of the year. Their open floor plan and low-slung booths lining the abundant windows create a casual vibe, while the wine list and a seasonally varying menu provide for fine dining. For their three-course Restaurant Week offering ($18), chef-owner Jason Rex starts you with salad or soup, such as vegan tomato basil bisque or crab chowder (both gluten-free). The Bucatini from the regular menu also is available, but the crab ravioli is unique to Restaurant Week: housemade pasta with onions, peppers, mushrooms, spinach and a tangy, rich beurre blanc. Have the best of both worlds with their 4-ounce sirloin surf and turf, topped with garlic prawns and a hearty demi-glace. For dessert, the crisp yet comforting taste of vanilla foils the seductive chocolate truffle cake, or try Scratch's variation on a classic apple crisp.